The idea actually came in January of 2012, after my two weeks HelpXing with some creative artsy people. They re-sparked my crafting itch. So I spent many nights in Madrid browsing craftgawker (I either avoided pinterest or didn't know about it), and one night I this post on Our Mini Family, which introduced me to the work of Curiously Wrought (etsy). Had I been making one for a girl, the heart may have worked; but I thought something else would be more appropriate for the civil engineer. I decided on Wisconsin's motion W when I moved back to the states, finally having the tools and materials for this craft readily available at my parents' house. Small nails, 3/4" in length. Thin string -- I bought the string at Michael's. Any colored string from a craft shop should work. My house just so happened to have a stack of wooden plaques by the front door when I moved home from Spain! (I'm completely serious -- I was just as surprised at the coincidence). My grandma had been cleaning out some of my grandpa's stuff, so she took off the paper certificates from various awards he'd won, and gave the bare wooden plaques to papa. There were already grooves and holes on the back side so that it could be hung vertically or horizontally, which made it perfect for this project! 2. Paint the wood the color of your choice. I did a couple of coats. First, with this ugly pink-y color we had. Then with two coats of a deeper red. 3. Print out an outline of the state. I found my template by doing a Google images search for "Wisconsin outline map". 4. Cut around the outline and tape it to the painted wood. I just used two scotch tape loops. You won't want it to rip off any of the paint, so don't go too crazy with the tape. 5. Hammer in nails around the state's border and the inner-shape's border. I spent many hours spread over two months hammering in all of these nails. 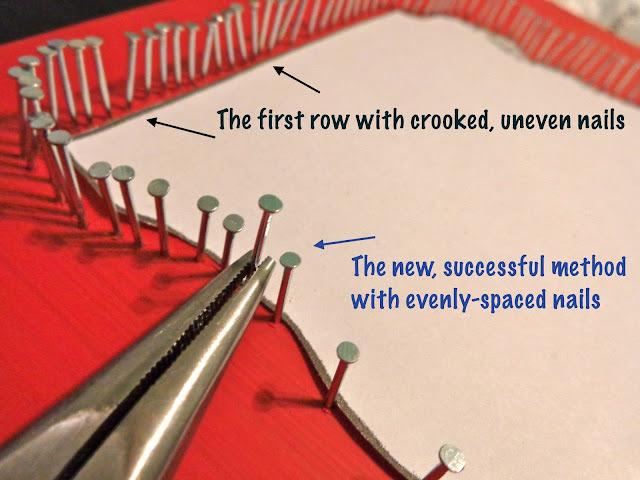 My first row was pretty bad, with lots of crooked nails and bent heads, but I later developed a method that worked well. The first row wasn't great because I would often accidentally hit nearby nails while hammering a different nail. I needed the nails to be close together, but the closeness made it difficult to hammer in nails alongside existing nails. To resolve this problem, I began to hammer in every other nail, leaving space to later fit one (or two) nail(s) in between. Since the two bordering nails were then already hammered in to the lower height, I had nothing to accidentally hit when I hammered in the middle nail. I also sometimes used a thin, long pliers to hold the middle nail in place as I hammered it in. Here's another tip: You'll want to hammer your inner design before you do the nearby state outline. If you do the whole state outline first, it will be a lot more difficult to get at the inner design with a hammer (and/or pliers). 6. Remove the paper state, do any final paint touch-ups if necessary, and count your nails. Count the number of outer nails and the number of inner nails. These numbers will be used in the final step, wrapping the string! 7. Wrap string back and forth between the inner design and the state outline. This was the most fun step for me, but unfortunately the quickest; it really doesn't take long to wrap the string! Use the number of nails to get a rough estimate of the number of times you should wrap the same inner design nail, while continuing around multiple outer nails. 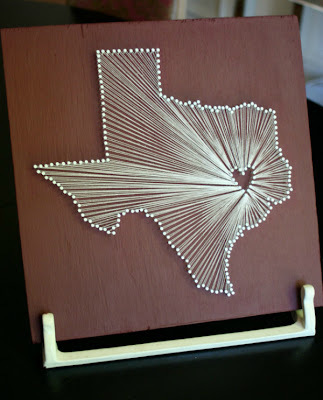 For example, if there were 200 state outline nails and 50 inner design nails, you would end up wrapping the string around one inner design nail for every four state outline nails (200/50 = 4) -- but that will be a total of four times around that single inner design nail. Am I making sense? Let me know in the comments if this is unclear, and I'll try to clarify. It doesn't have to be exact by any means. Play around and see what looks good. In the thumb of the state (on the right side) I did some criss-crossing to fill it in. My string broke on the right half of the motion W, which can be seen in the picture below. I just retied it to the small ball of string and kept wrapping. You really can't tell in the finished product. When I got back to where I had started I tied a few knots, then threaded the string up and down along some of the outer nails just for extra measure. The finished product: Ta da! That turned out sweeeeeeeeeet! Go Badgers! Thanks for the tutorial. How long are the nails? You bet! The nails I ended up using were 3/4" long.